Mixxx Development Blog: Mixxx 1.9.0 Released! Ubuntu 10.04 (Lucid) 1.9.0 from PPA not available, only 1.8.2 installs, the PPA website says there we're build errors. The Windows 32 bit download page seems to be down, so I can't download 1.9.0. Jsyk. Anonymous: I spent a few hours trying to get the Lucid package working but got stuck on one last little problem. I'll give it another shot tomorrow, sorry for the inconvenience. Levi: I just switched our DNS over to CloudFlare to help ease the load on our webserver and I missed one very important entry. Thanks for pointing this out so quickly, should be back online in a few minutes! Hey again, sorry I wasn't able to try again after you posted that, but a few hours later, I'm still not able to download. I'll try again tomorrow. does Meta Data writing enable you to add art work? That's great news. Thank you guys for your frequent releases. I'd love to make a donation, but I don't use Paypal since what happened with WikiLeaks. Will you consider giving another option for people to give to the programmers? I'm planning to join Flattr, but choice is good. Great work folks. Respect to everybody contributed. @Anonymous -- Mixxx is Free and open-source. You can download it without charge from http://mixxx.org under the GPL. @chtfn We'll take a look at the options. In the mean-time, flattr has worked pretty well for us. I just wanted to come to the blog to thank you for the awesome work you've done in the last Months to make Mixxx the one Open Source Options for DJs worldwide! I'm definitely porting to Mixxx right now! Lots of work you guys did, much appreciated! Please provide a 64bit version of Mixx for Mac on the DL-Page. I need Vinyl-Control, but like to have a 64bit edition. Albert fixed the PPA today I believe -- give it another shot? Sorry for the delay! @cimnine -- we'll give it a shot, thanks. It works well on Ubuntu for me: ALSA, drawing waveforms, etc. The last releases (1.7, 1.8) didn't work for me at all. This seems more solid so far. Great work. Yep, I got the upgrade. Thanks again, folks. Great work! I saw the 64-bit version on the Mac App Store and the 32-bit version as a separate download. My question is why don't you put both versions on the Mac App Store? That way I can keep track of updates? The reason we have a 64-bit version in the App Store is basically just circumstance. It's a long story, my development machine is temporarily stuck making 64-bit builds, so in the interest of getting 1.9 into the App Store as quickly as possible, I just went with it. I know that this might be a rather dull question, but I'm using Ubuntu 10.10 and I've tried to install Mixxx through Software Center and through PPA and I can only get the version 1.8.1,so could you give me any hint on how to fix this and get the 1.9.0? I've tested mixxx 1.9.0 in AutoDJ mode from ppa under ubuntu 10.04 with Jack and projectM. Sometimes jackd (qtjackctl) loose the connection with mixxx without any error message. So music stops and that's all! You might be experiencing xruns or hangups that are causing the JACK watchdog process to disconnect Mixxx. Try increasing your latency in qjackctl and checking the number of xruns it reports. I've already do that, because some error messages like "Récupération désynchronisation (XRUN) (1). The PC is not very recent : P4 3Ghz (with f*****g intel motherboard) 2Go ram ubuntu 10.04 fresh install and ubuntu studio tuned. leaving AutoDj playing during hours to test stability. When in the browse mode when you go from a subfolder back to the main library the meters seem to freeze for a second or so. Great product. Been using it with great success. There's only one little thing: The executable inside Mixxx.app (Mac OS X) is named mixxx (lower case, while in the Info.plist it is named Mixxx (upper case). But it is very easy to fix. Mixxx is really a great program! Since my old friend DeKstasy has died (keeping a PPC app alive with just two guys is hard) I was very happy to find Mixxx. And the best for my: it is not limited to Mac OS X. I hope the Mixxx story continues! Excellent work! 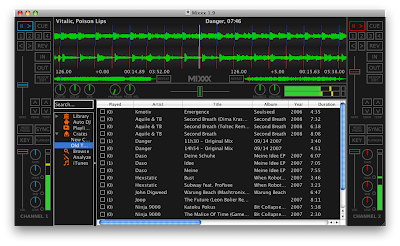 Mixxx is undoubtedly the best program to mix mp3 files in Linux! will there be packages for natty in the ppa soon?